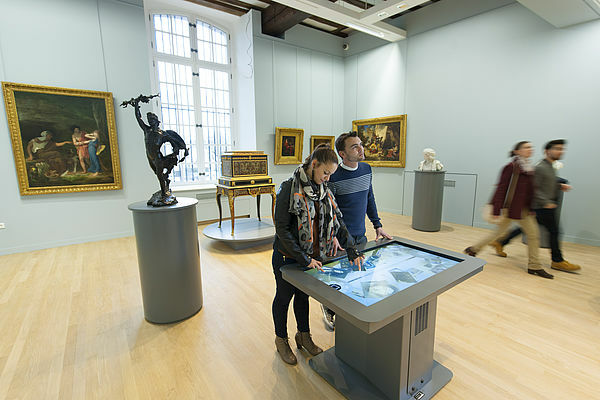 Located in the shadow of the Beauvais Cathedral, MUDO – Musée de l'Oise is housed in the former Beauvais bishops' palace built in the 12th century by Henri de France, brother to the king. After several years of renovation combining development of the local heritage and contemporary design, in 2015 the Museum presents a magnificent selection from its 19th century collection right in the heart of the episcopal palace. A multimedia guide will accompany you on your visit to the permanent collections. You can also download the application to your smartphone: Apple Store and Google Play. During your tour you will also be able to use the interactive table at the mid-way point of the tour. Three applications shed additional light on the works displayed in an educational, fun and intuitive way. The Museum offers many events to introduce you to the permanent collection and the temporary exhibits and expand your knowledge in a different way. First Sunday of each month: themed guided tour from 3:00 – 4:30 p.m.
Second Saturday of the month: lecture in the Thomas Couture room. Third Sunday of the month: “family tour”, a fun approach for parents and children ages six and up.